New menu: The Rivals indoor beer garden at Royal Exchange. The Royal Exchange is being transformed into a major new food and drink destination. 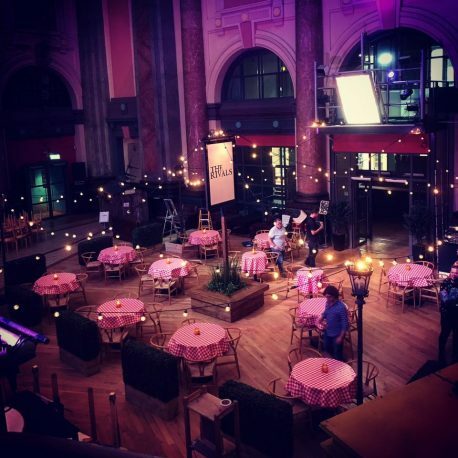 The theatre’s restaurant, bars and cafe is now The Rivals, named after the Exchange’s first stage production in 1976 while the luxurious Great Hall is home to an indoor beer garden which has just opened. Expect urban cool vibes amid the venue’s stunning architecture: this dramatic renovation is fronted by Goska Langrish and Coronation Street actor Rupert Hill, the team behind the award-winning Parlour in Chorlton among other venues. There’s a new menu that includes dishes such as braised featherblade of beef, a roast and pickled cauliflower risotto & haddock and parsley fishcakes, plus a revived drinks offer with cask ales and craft beers, plus space to host a range of live events. The indoor beer garden is open now, while The Rivals restaurant and bar will open to the public on Thursday 14 September.